On a recent trip to Los Angeles we were lucky enough to travel with some great friends. Not only are they fun to hang out with, they also seem to share our same adventurous spirit when it comes to food. These are the same folks that joined us for one of the most magical dinners we had in Paris, but I’ll save that for another time. 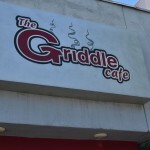 This particular trip to Los Angeles was filled with many great meals but one breakfast in particular stands out for me; The Griddle Cafe. 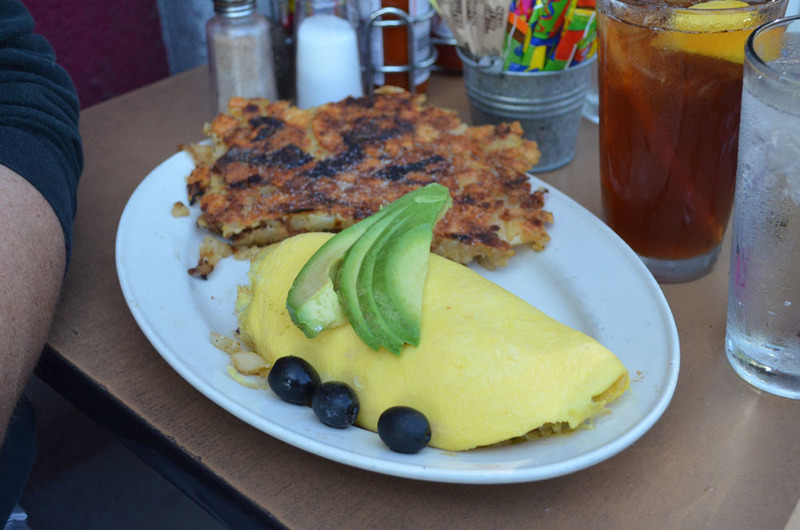 Located on one of the most famous roads in all of LA, Sunset Boulevard, the Griddle Cafe is easy to miss if you don’t know where to look. The only clue you have that a great meal hides nearby is the line of people waiting for a table that can spill out the door and up the sidewalk. We were very luck the morning we ate there. We arrived early enough that the lines had not formed yet. It was still very busy, the entire inside was full, and we were offered one of the few, small tables on the sidewalk. At first I thought I was going to hate eating outside in LA on a busy street but it was fantastic!!! I was even more thrilled when I went inside to use the restrooms and saw how crowded and heard how loud it was. Boy, did we luck out!! The Griddle Cafe is famous for their pancakes, and I can certainly see why. Thirteen choices of pancakes greeted us this morning; offering everything from ‘plain buttermilk’ to ‘crushed Oreo filled’ and much more. The one member of our party who settled on the pancakes opted for the “BLUESberry”. 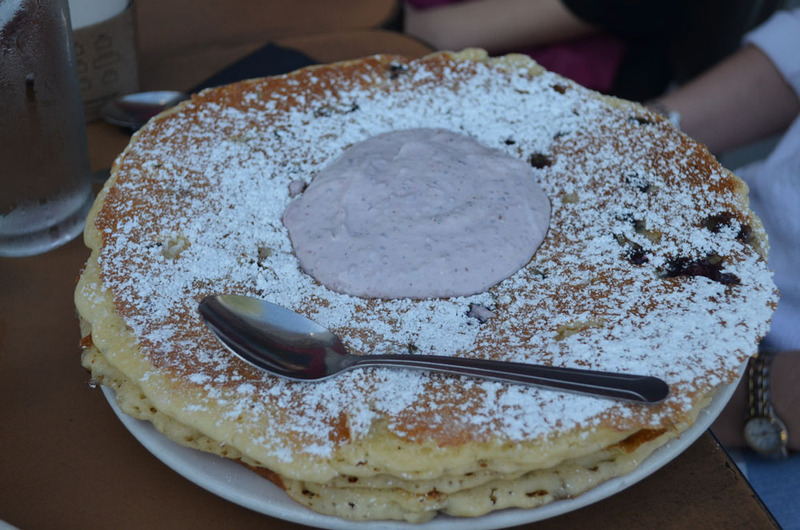 Imagine her surprise as she received a plate of three light, fluffy pancakes the size of a 12 inch dinner plate? A multitude of blueberry’s filled each one and as if that wasn’t enough there was a puddle of blueberry sour cream in the center. These were incredible. We all had a bite and I think there was still 1/3 left over. Another member of our party ordered the “Cobb Omelette”. Did you ever read something on a menu and just know the person you were dining with would order it? That was this omellete. It had grilled chicken breast, bacon, green onions, crumbled blue cheese and was topped with slices of Avocoda. That came with a side of grilled potatoes. The omellete was delicious with a very fresh, California taste. The potatoes were a little too over done for my taste but the onion added a nice flavor. The third member of our party ordered the “Hunger Pangs”. This was three eggs (he had them scrambled) and a thick cut piece of ham with a side of grilled potatoes. He opted for tomatoes on top. This was tasty and he enjoyed it but with so much else on the table it wasn’t my favorite. I opted for “Mom’s French Toast” and boy was I ever glad I did. 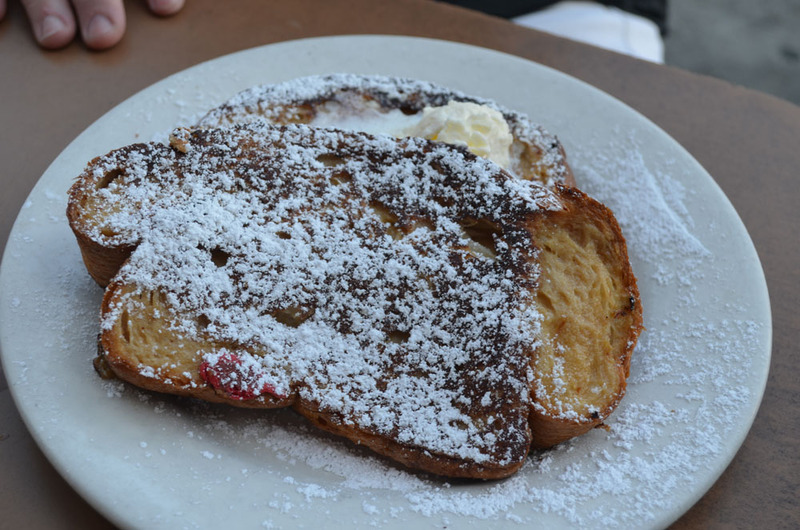 Two huge pieces of French Toast came with powdered sugar and whipped butter. I added a little maple syrup and was in heaven!! 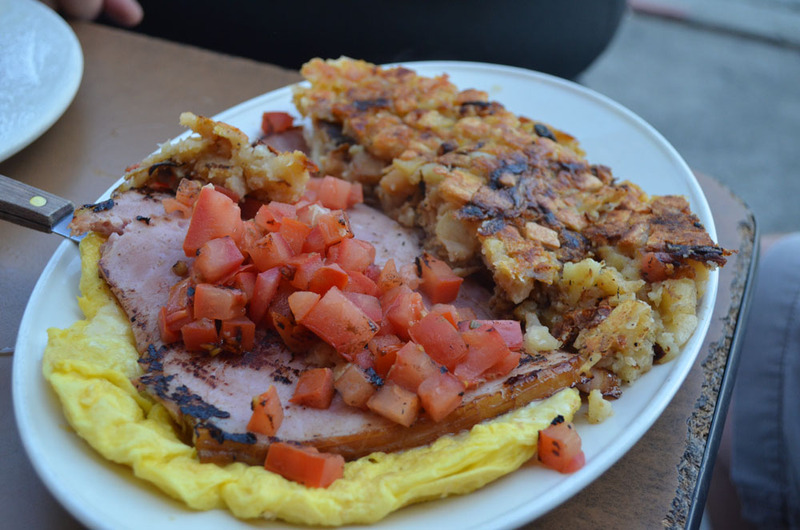 The Griddle Cafe is rated as one of the best breakfasts in Hollywood and I can certainly see why, but I reserve final judgment until I am able to taste all of the other breakfasts in the area. This entry was posted in Foodie Tales, Foodie Travels and tagged Best Breakfast in Hollywood, Blue Berry Panckakes, Califonia, California, eggs, French Toast, Griddle Cafe, ham, Hollywood, Hollywood California, Los Angeles, Los Angeles Califonia, omelet, Pancakes, scrambled eggs, Sunset Bloulevard, The Griddle Cafe by John Magi. Bookmark the permalink. 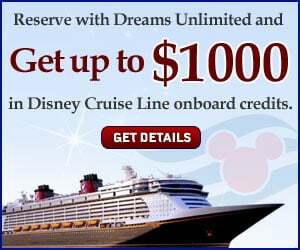 John lives in Central Florida with his husband and two dogs. He has turned his passion for Disney and for Food into a career that has allowed him to travel all over the world and experience all types of food. He is looking forward to sharing many years of Foodie Tales.